1. This Sat 13 Apr we need help getting the Race Track trail ready for the Red Rock Jamboree. The Race Track is out at the sand dunes. Please bring gloves, shovels, clippers and a small chainsaw is needed. Contact Tony Wright for more info. Departing the Port if Entry outside of town at 9:30 this Sat 13 Apr. 2. The Club will go out to Fin Little on 19 Apr to work on the trail. 8:30 departure from Old Stamping Up Parking lot ( next to Kanab Vet Clinic) on Hwy 89. Shovels and rakes, and one pick needed. Bring your lunch. We will be riding our OHV's from a staging area to Fin Little. April 27, 2019 there will be a US Highway 89 cleanup. More to come when we know it. Those wanting to volunteer contact Club President Tony Wright who can explain the benefit of Volunteering. Phone: 435 899-8116. Needed Guides and Drags, volunteers for the ATV Club Booth. Kanab's Red Rock ATV Jamboree will take place May 1-4, 2019 in the heart of Red Rock Country. Activities happening from Jacob Hamblim City Park. Sign up today for 4 days of social breakfasts & dinners, 10-14 rides per day, swag bags, and a chance to win prizes at the end of the weekend all for only $100 per person. You will find yourself lost in the beauty of local hidden gems such as: Dinosaur Tracks, Native American Ruins & Writings, Sand Dunes, Slot Canyons, Scenic Vistas, Alcoves, and Historic Movie & Pioneer sites all along the Anasazi Trail System in Kane County. Each trail will be rated depending on skill level, so bring family & friends of all ages! There will be numerous OHV fun on our guided rides in the Red Rock Canyons of Kane County, Utah. Please note that a pre-registration waiver is required for all drivers. Watch the below link for registration forms coming out soon. JUNE 11 to 12, 2019 ATV Club OHV Overnight Ride: Tuesday and Wednesday, to Escalante overnight. and return. Make your Motel Reservations early:Rooms at the Prospector Inn, Escalante, UT. They take telephone reservations and can be cancelled up to a day before. Phone: 435 826-4653. 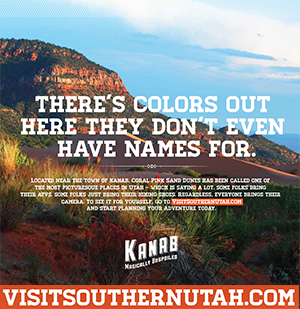 (Tell them you are with the UT/AZ ATV Club from Kanab, UT). Watch for ride details to be posted. June 25 to 28, 2019 four days three nights. Utah and Nevada Ghost town tour. Leaving June 25, 2019, Two Nights in Ely, NV: Tuesday Night June 25 and Wednesday Night June 26. One night in Pioche, NV. : Thursday night June 27. Not a member of the ATV Club Road Trip Chapter: Contact Sam if interested. To review the schedule for the Planning for the 2019 Rides, Camp-out's and special events. Go to the Rides/Camp-Outs roll over tab on the top of the home page. Then click on 2019 Rides/Camp-Outs Schedule.